About 5 years ago I was testing the various models available for use in Blender and comparing them to the SL default avatar. Now Gaia of AvaStar has done that for you. Check it out. I think it is really nice to have this information. But, there isn’t much use for it. Mesh clothes built based on the default avatar are simply never going to fit well. The sliders will always change the classic avatar and mesh clothes at different rates. The classic avatar use morphing. Mesh clothes use rigging. Those two things respond differently. However, the AvaStar model will get you as close to a match as is possible. Posted in Blender, Clothes Skins Etc, Mesh, Second Life. Tagged Avastar, Fitted Mesh, Mesh Tutorial. The question keeps coming up in the SL Forum, what is a mesh body and why won’t my clothes show? I am so confused… Yeah, I can see how that would happen. So, I need something I can link them to. This is the ‘something’. I’ve tried to keep it simple for noobs without 3D modeling experience. 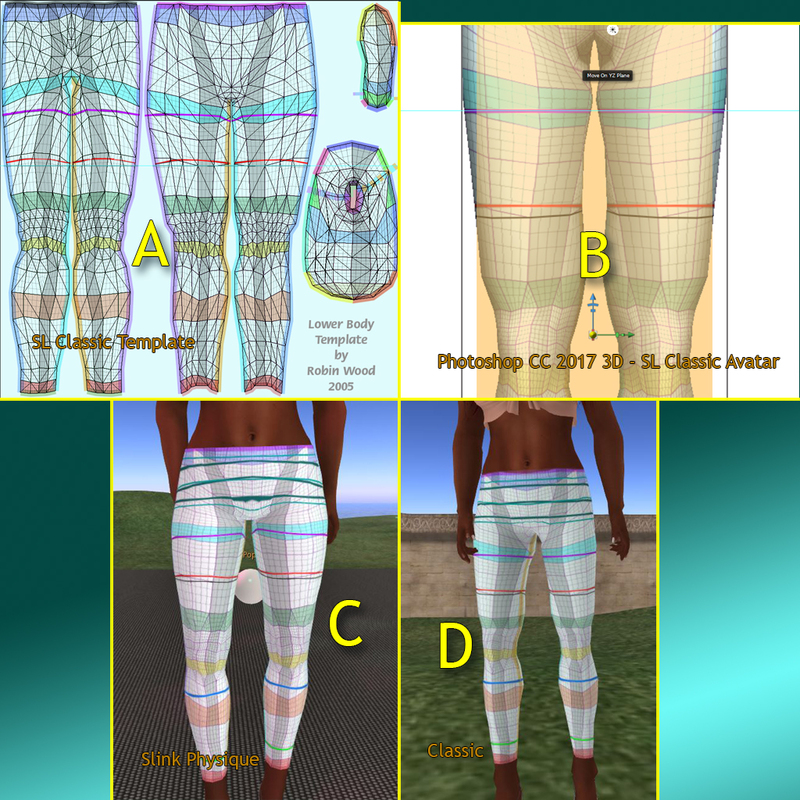 To understand Classic and Mesh avatars one has to understand Second Life™ has a history and understand some of the basics of 3D modeling. SL Started in 2003, 2004 depending on what you define as ‘starting’. It started with a basic avatar that evolved over time. That is the Classic avatar. It is still with us. Posted in Clothes Skins Etc, Fashion, Mesh, Second Life. Tagged Avatar, Avatar Skin, Mesh Tutorial. The Blender-AvaStar combination is still the least expensive entry point for making clothes, animations, and avatars for Second Life™. Blender is free and awesome, if difficult to learn. AvaStar has sold for US$27 for, I think, a couple of years. So, a price increase is to be expected. Posted in Blender, Clothes Skins Etc, Second Life. Tagged Avastar, Mesh Tutorial. Making stockings for the Classic and Slink legs has some challenges. One is understanding how to get a straight edge at the top of the stocking. I’ll explain some of the oddities between Second Life™, Photoshop, Blender, Classic and Slink. The frustrating oddity is dealing with avatar templates. Slink and Classic are not compatible, close but a problem. In the image, look in the ‘A’ section, there is a copy of one of the Robin Woods templates made for the Classic Avatar. I’ve used Photoshop 3D to paint some lines on it. Posted in Clothes Skins Etc, Mesh, Second Life. Tagged Appliers, Fitted Mesh, Mesh Tutorial, Tutorials. There are things I had for my classic avatar that I can’t find for my mesh avatar. There are some classic stockings that had great lacy tops and topped out at just the right place on my legs for my mini and mid-thigh skirts. I’ve not found similar stockings for my mesh body. So, I am making them. There is a lot to learn. The Appliers are simple enough, but one does have to figure them out. 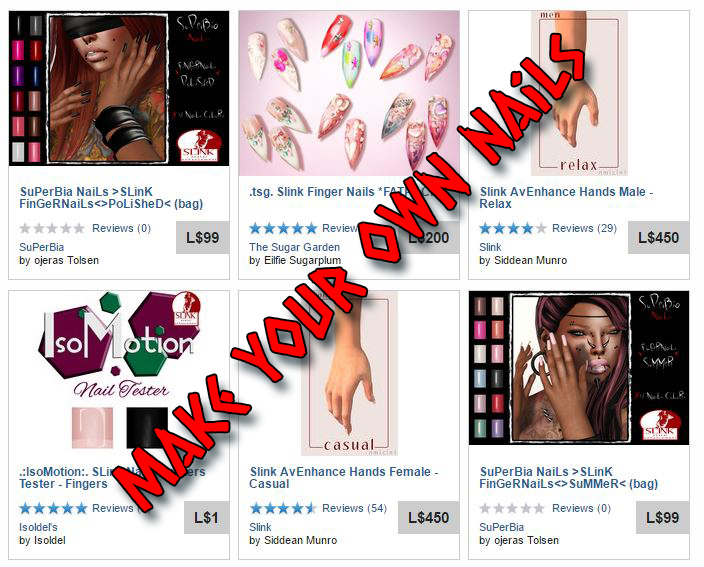 See my tutorial for making Slink Hand’s nails. It isn’t difficult. But, it is different. Next is the challenge of using Photoshop to make the textures. I once used Multi-Chan Hax to handle the SL Avatar UV Map Seams… But, that is 2011 tech and I haven’t tried it in PS CC 2017. However, PS 3D is NOT intuitive. I am tempted to say Blender is more intuitive than Photoshop’s 3D. So, I’ve been going through tutorials and watching videos. They never seem to answer the questions I have or solve the problems I am running into. But, I did find one that I think is way helpful. So, here it is. Posted in Photoshop. Tagged 3D Photoshop, Mesh Body, Mesh Tutorial, Tutorials. I came across this one: The FAST Method for Creating Realistic Materials & Textures || Blender Tutorial I’m including the link because there are a number of handy links on the YouTube page. The CrazyBump normal maker talked about in the video is a US$99 retail app. There is a demo video on the site. It is impressive. The site is VERY small, almost nothing to read. If you an analytic personality, it isn’t enough. However, CrazyBump has been around for a while. I first downloaded it in 2013, v12. It is now version 122. Posted in Blender. Tagged Mesh Tutorial, Tutorials. Medhue Simoni is one of the better know modelers and animators in SL. He has a post in the SL Forum containing videos that show how to make your own LoD (Level of Detail) models. Posted in Mesh, Second Life. Tagged Mesh Tutorial.